This hearty country dish from the Provence region of France (Nice) is an easy mix of seasonal vegetables, garlic, aromatic herbs and olive oil. 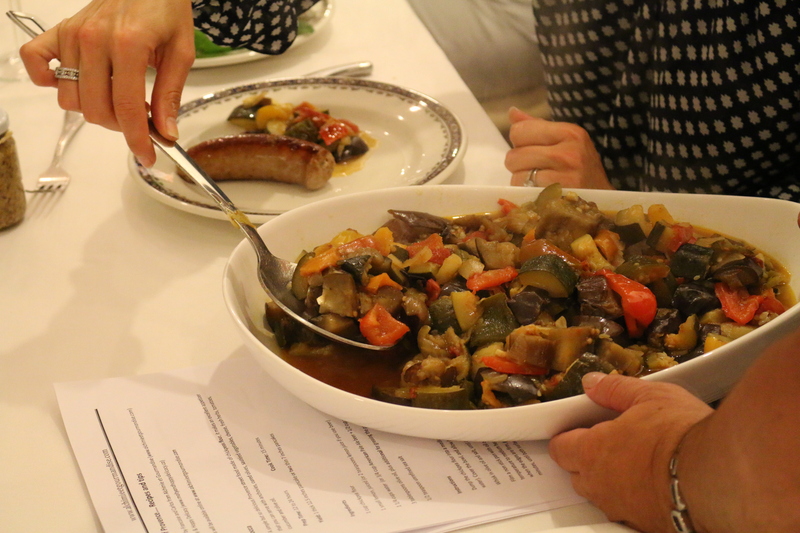 And yes, ratatouille is one of the summer dishes per excellence, not only in Provence but now in each region of France. In my family, we cook each time a large quantity, we enjoy this yummy vegetable stew with couscous, or we use the leftover as the main ingredient for different recipes during a week period. In my family, we plant tomatoes and zucchinis and we harvest a lot of them (giant zucchini!). 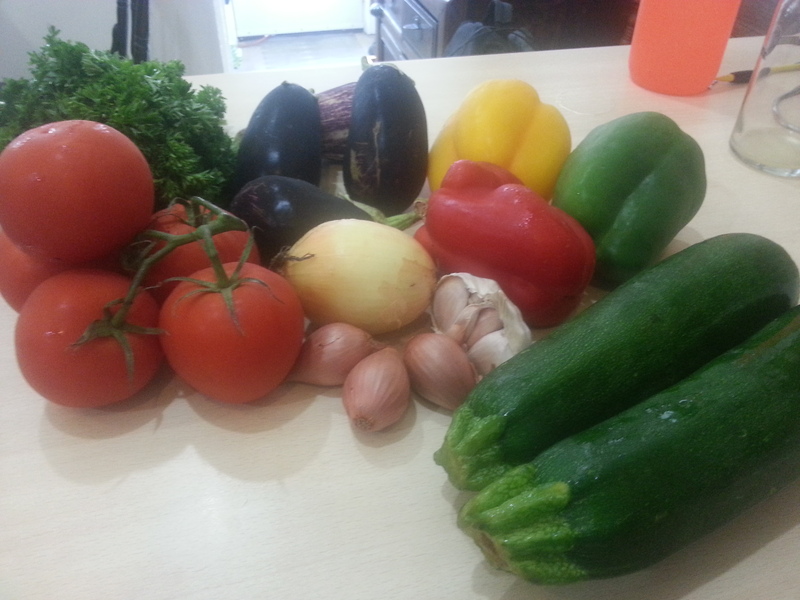 Then, my sister in law – Isabelle spend some days during her holidays canning and/or freezing ratatouille. When I am in France, visiting them for Xmas, I have the opportunity to enjoy the taste of the sunny vegetables. Wash all vegetables under warm water with a soft brush. Dice the onion and mince the shallots. Roughly chop the peppers, zucchinis, eggplants, and tomatoes into bite-sized pieces. Mince two garlic cloves. 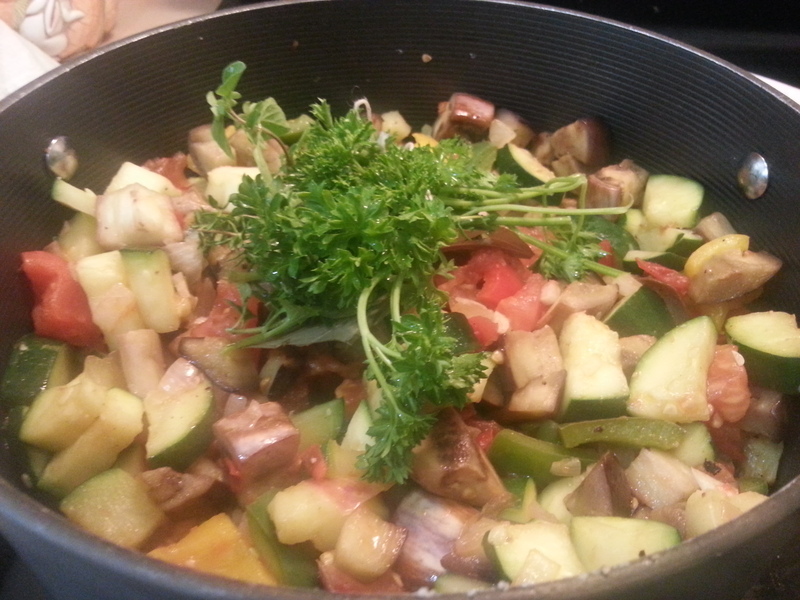 The vegetables will be cooked in batches, so keep each one in a separate bowl. Why I recommend to use “the sauté each vegetable separately” method? This dry-heat/high-heat method not only cooks off a lot of water from the vegetables but it helps concentrating their flavors. Another positive point, each piece of vegetable can brown and caramelize, which deepens and rounds out the flavor of the dish. Finally, the last benefit is that you can season each vegetable properly and cook it to just the right texture. Warm two tablespoons of olive oil in a large (at least 5 1/2-quart) Dutch oven or in a non stick pan over medium-high heat. 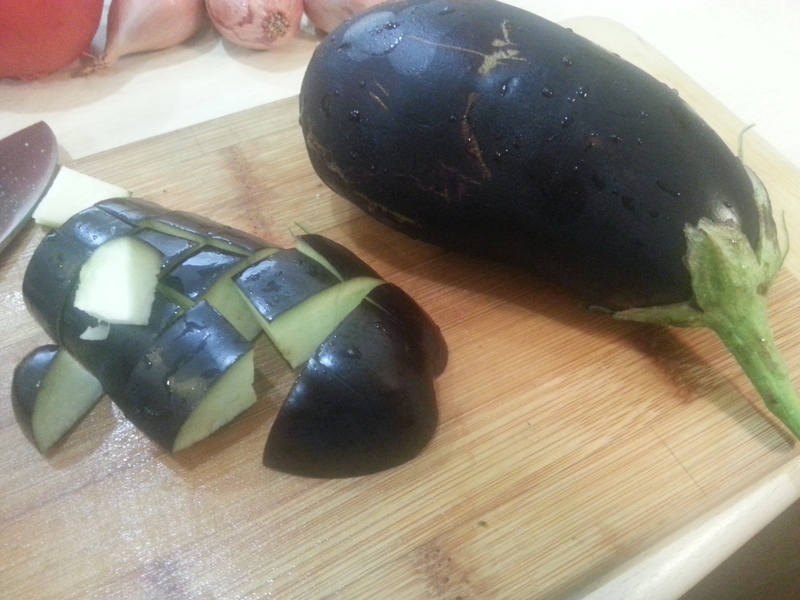 Sauté the eggplant until it has softened and has begun to turn translucent, about 10 minutes. Transfer the eggplant to a bowl. Add another tablespoon of oil to the pot (or pan) and sauté the peppers until they have also softened, about 5 minutes. Transfer the peppers to the bowl with the eggplants. Add another tablespoon of oil to the pot (or pan) and sauté the zucchini with a generous pinch of salt until the zucchini has softened and is beginning to brown, about 5 minutes. 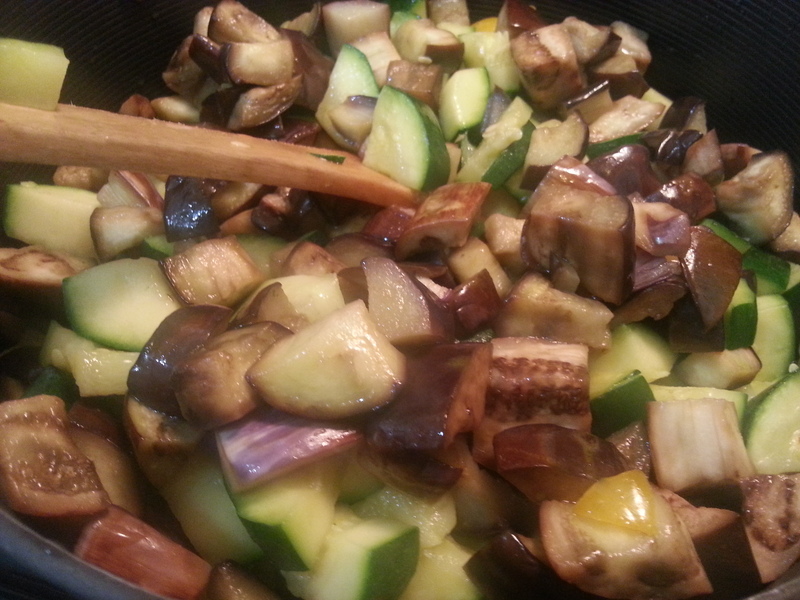 Transfer the zucchini to the bowl with the eggplants and peppers. Add one tablespoon of oil to the Dutch oven pot and add the onion, shallots and a generous pinch of salt. Sauté until the onion and shallots have softened and are just beginning to brown, about 10 minutes. Add the garlic and sauté until fragrant and just starting to turn golden, about 1 minute. Add the tomatoes, and continue cooking for another 5 minutes. Scrape up the brown glaze on the bottom of the pan if any (good flavors). Add all the vegetables (i.e. peppers, zucchinis and eggplants) into the pot as well as the bouquet garni and some ground pepper, and stir until everything is evenly mixed. Bring the stew to a simmer, then turn down the heat to low, half cover with lid. Stirring occasionally, simmer for at least 20 minutes or up to 1 1/2 hours. Shorter cooking time will leave the vegetables in larger, more distinct pieces; longer cooking times will break the vegetables down into a silky stew. 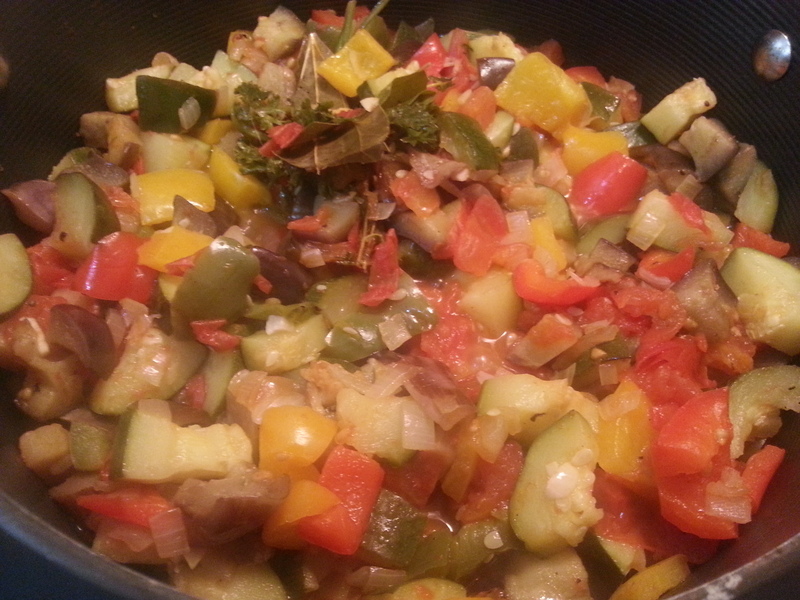 I cook my ratatouille for 45 minutes (in general) at low heat and as you can see in the different pictures posted in this blog the pieces of vegetable are still distinct. With or without the lid, it really depends on how much juice I have in the pot – the idea is to reduce it if too much juice. Don’t rush your cooking process… I find cooking slowly helps to build and bring together the complexity of flavors. Ten minutes before the cooking time ends, add two crushed garlic cloves and cover. 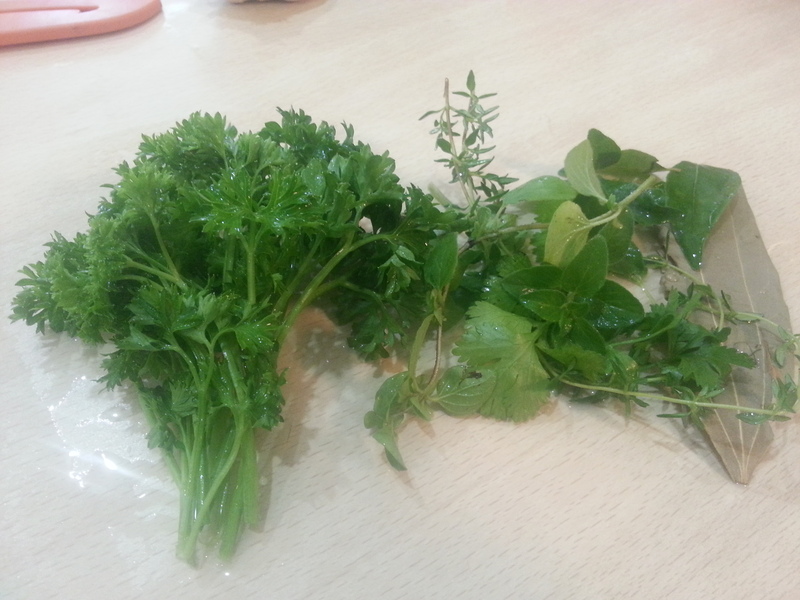 Remove the bouquet garni. Sprinkle basil and a glug of good olive oil (if you want) over each bowl as you serve. Leftovers can be refrigerated for a week or frozen for up to 3 months. 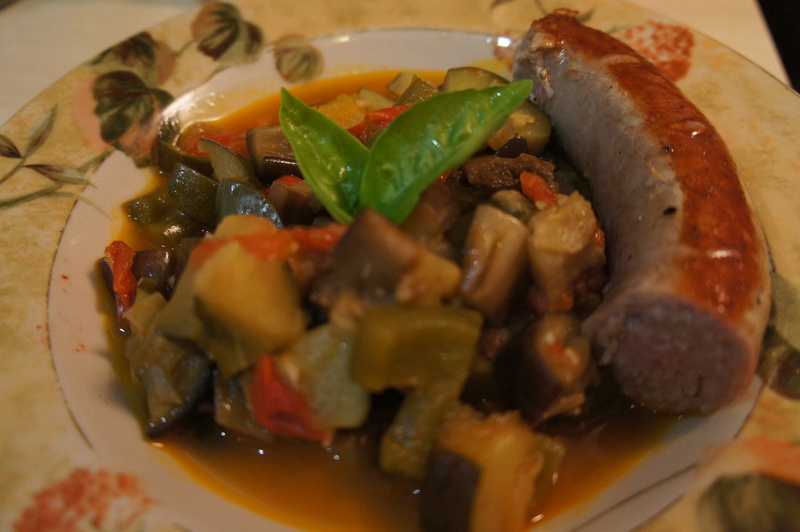 Ratatouille is often better the second day, and it can be eaten cold, at room temperature, or warm. If you want to make a smaller batch – cut in half the recipe and don’t be afraid to adapt it and use whatever vegetables you have. You can add extra flavors – for something different, why not to try adding a tablespoon of smoked paprika, a pinch of red pepper flakes, 1/4 cup of red wine, or a splash of vinegar to the ratatouille.